This is my breakfast this morning! I figure why not! I was starving and knew I wouldn’t be satisfied with only the two eggs I have in the fridge. I also found out my pesti goes bad after 5 or 6 days so I was basically forced to make this gnocchi for breakfast. So delish! 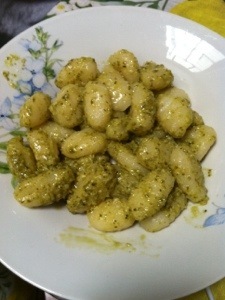 This entry was posted in Food, Life in Italy and tagged breakfast, gnocchi, italy, pasta. Bookmark the permalink.